Sauvignon Blanc by Jackson Estate of Marlborough. These bright characters follow through to the palate, crisp white stone fruit flavours and an underlying lees driven textural backbone, supported by fine mineral concentration. Adam Jackson bought the first blocks of land at the heart of Marlborough and took up farming in 1855. The Jackson viticultural team can rely on harvests of perfectly healthy fruit, each is scheduled at vintage for picking at optimum levels of ripeness. Fresh acidity gives the wine lift, balance and a palate cleansing finish. Jackson's wife planted a gumtree along Jacksons Road, it is now a regional icon, forty five metres in height, depicted on the Jackson estate label. John Stichbury is the fifth generation of Jacksons to farm the land. In 1987 he established vines and released his first vintage in 1991. Jackson wines went from strength to strength, claiming the coveted Sauvignon Blanc Trophy at the London International Wine Competition in 1993. Jackson Estate now own and operate a bounty of super fine vineyards, closely managed throughout the growing season without compromise, to yield harvests of the highest quality fruit. The estate vineyards underlying shallow, fast draining, low fertility soils, grow vines of fortuitously low vigor, for the production of a range of aromatic and richly flavoured, world class wines. Jackson's Homestead Vineyard was the original block of vine, established on land which had been sustainability farmed by the family for five generations. Planted to Sauvignon Blanc and Riesling, Chardonnay and Pinot Noir, it is named after the giant gum tree which towers over the landscape and adornes every bottle of Jackson Estate wine. Fruit grown to this site is full of stonefruit and bell pepper characters. The combination of mature vines over stony, free draining silt loam soils are the foundations of the underlying minerality and intense herbaceousness for which Jackson Estate wines are renown. To maximise the superior quality fruit, ensure control of harvest and the winemaking process without compromise, a design and purpose built winery was commissioned in 2003. Built by Adam Watson Jackson in 1912 and named Runnymede after the family's hometown, the Jackson homestead is a fine example of New Zealand colonial architecture, retaining many of its original features and housing a wealth of rich regional heritage. The grounds are lovingly maintained, an original orchard planted by the first generation of Jacksons still bears fruit today. Eversley Vineyard in Waihopai Valley is a well established Pinot Noir site, planted to five different Burgundy clones, chosen for their suitability to site and ability to produce world class wine. No irrigation is applied to the heavy and tighltly bound clay soils, Eversley consistently provides fruit that shows great depth of flavour with outstandng structure, balance and concentration. The Somerset Vineyard, in another part of Waihopi Valley, is also well established, to Sauvignon Blanc and Pinot Noir. Extremes in climate variance between day and night, along with heavy and tightly bound clay soils, maximise flavour intensity and produce pure, concentrated fruit flavours with outstanding structure and balance. Somerset grown Sauvignon Blanc has striking aromatics in the tropic and stonefruit spectrum, contributing structure, depth and texture for Jackson's Stich Sauvignon Blanc. Jackson Estate have been at the forefront of New Zealand viticulture ever since establishment, they remain a leader in industry innovation. Pioneers of the stelvin closure, they are one of the first wineries to employ helicopters for frost protection of grapes. Jackson's also contributed to the development and manufacture of strobe lights in the vineyard for the purpose of guiding and assisting the helicopters as they went about their work. 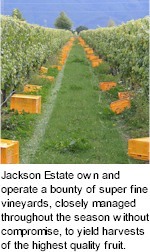 The Jackson viticultural team introduced the use of frost alarms amongst the vines through modification of car burglar alarms. They further initiated the manufacture of bird scarers when none were available and which are still in use. On display today at the Marlborough Wine Museum, is the first self adhesive labeller, invented by the Jackson team in 1992. Trying their hands at show business, Jackson's teamed up with Jancis Robinson and Montana to produce a movie which promoted Marlborough as the world's Sauvignon Blanc capital. Jackson Estate wines have their own individual style and are far from main stream. The goal of the viticulture and winemaking teams is to embrace old world winemaking practices through new world technology. Stylistically, Jackson Estate practices old world, hands off winemaking techniques that enable expression of site and remain true to varietal purity. The Jackson team hope that you will enjoy sharing their wines as much as they have enjoyed making them.